Jesse O’Neill The New York City Marble Cemetery was founded in 1831, when the Lower East Side was tracts of farmland and the city’s northern border was Grand Street. Tucked on a sleepy stretch of East Second Street, between First and Second Avenues, the New York City Marble Cemetery is one of the oldest institutions in the neighborhood. It featured prominently in headlines earlier this month when a cache of military-grade explosives was found abandoned there in a garbage bag. Otherwise, the cemetery keeps a resolutely low profile. Closed to the public and shrouded by 250 feet of grand iron railings, it is the resting place of some four thousand souls who shaped the modern city. On a recent visit, Colleen Iverson, the cemetery’s director, introduced me to our late neighbors. 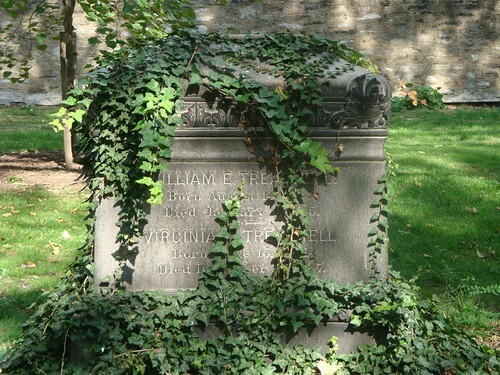 The cemetery was founded in 1831, when the Lower East Side was tracts of farmland, a retreat from the bustling city whose northern terminus was around Grand Street. As Ms. Iverson explained, the location was prime, because our 19th century predecessors believed that Second Avenue would eventually transform into a fashionable residential thoroughfare. It never quite became Park Avenue, but by the 1850’s there were eleven cemeteries in a three-block radius. New York City Marble is one of only two that remain. The other is the unrelated (despite the name) New York Marble Cemetery. 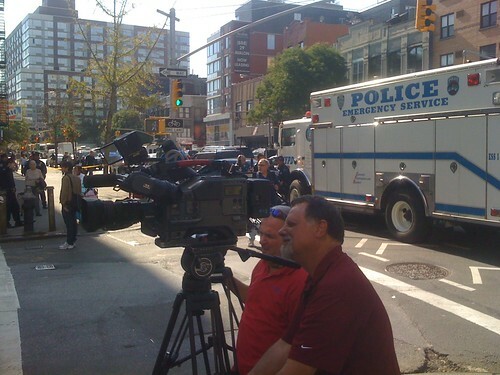 Jenn Pelly The bomb squad was called to the New York City Marble Cemetery this morning after a report of a suspicious package. Jenn Pelly Police Commissioner Raymond W. Kelly (right) said that the explosives could not have gone off because there was no detonator. A volunteer at an East Village cemetery discovered a stash of old military explosives this morning setting off a chain of events that brought out the police department’s bomb squad and jarred nerves around the neighborhood. At a news conference near the cemetery this afternoon, Police Commissioner Raymond W. Kelly said the explosives were potentially deadly but that there was no danger that they would go off because there was no detonator. Commissioner Kelly said that the explosives – eight sticks of C4 – had originally been found last year by a caretaker at the New York City Marble Cemetery, on Second Street near First Avenue, who unearthed them and placed them next to a tree at the rear of the property. That’s when a volunteer at the cemetery found the explosives and asked the police to remove them. The authorities initially believed that there might be a link between the notes and the explosives but dismissed that possibility after investigating further and now believe that the incidents are unrelated. The authorities received a call about 10 a.m. this morning reporting that the package had been found in the cemetery on Second Street between First and Second Avenues. The cemetery, which is usually closed to the public, had been open during the weekend for the eighth annual Open House New York weekend. The bomb squad was called to scene along with a police helicopter to search the area. Commissioner Kelly said that the police investigation is continuing and that the bomb squad would continue to search the cemetery for additional explosives.